What is a Historical Ghost Walk? Our Ghost Walk contain a great deal of Historical information and of course it’s legends. You will follow your guide for 90 minutes and hear tales of murders, myths, mysteries, executions, assassinations, diseases and ghosts. You will have the opportunity to see, touch, smell and taste the history. 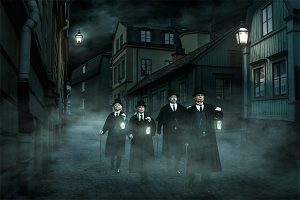 Join The Stockholm Ghost Walk for 90 minutes of history and mystery. Explore the dark streets and alleyways that make up the oldest parts of Stockholm – Gamla Stan.